Angiobiane may be recommended to help reduce the feeling of heavy legs. Tingling, heaviness are often a sign of a lack of venous tone. 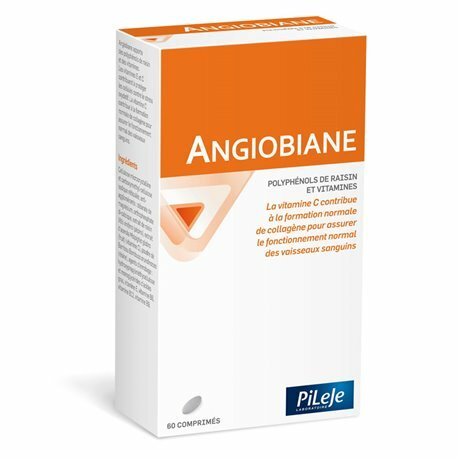 Angiobiane provides flavonoids which help maintain good circulation and antioxidant vitamins, which help maintain a normal structure of the vessels. 2 tablets: the concentration of vitamin C is 40 mg, 66% RDA * Vitamin E and 10 mg alpha-ET or 100% RDA *. * Recommended Daily Allowance of Directive 90/496/EEC. 2 tablets per day to swallow. Storage: in a cool, dry place. Anti-caking agents: microcrystalline cellulose, magnesium stearate, calcium orthophosphate di-and silicon dioxide, grape seed extract, acerola powder, vitamins (E, B6, B12 and folate), coating agent: cellulose derivatives and monoglycerides of fatty acids, filler: crosslinked sodium carboxymethylcellulose.